How can one take such a promise seriously? Earning $100,000 per year, which is already fantastic for someone looking for a job, would not be sufficient for mansions, yachts, etc. It is an autobiography based on a diary kept between 1946 and 2004 (in the USSR, Poland, France and the USA). Also keep in mind that even a regular "diamond" which is considered successful only makes a few hundred k a year from amway. Not a bad income but certainly not the millionaire lifestyle. Amway is a legalized pyramid scheme. Uhuh, a legalized illegal scheme It doesn't even match the most basic requirement. But I submit that if it was as great as you maintain it is, you would be pursuing it instead of just buying a product here and there. How do you know I haven't been pursuing something better? How do you know I haven't been in jail for the past decade? How do you know I haven't been working for charity? You have no idea of my motivations or life circumstances. Just another bankrupt argument typical of the mlm critics. They dismiss supporters of the model who are involved as biased. The dismiss supporters of the model who are not involved as lacking credibility because they're not doing it. You're right, nobody would take such a promise seriously. My guess is nobody makes such a promise - Joecool is making it up. Having said that, there are people with mansions, yachts, etc, but they make a lot more money and took a lot more years to do it. Yes, I'm making up my experience. WWDB runs annually, a function called Dream night where they show slideshows of mansions, yachts, jets and sports cars. 2-5 years, build it right, come join us (the diamonds). There's plently of evidence, even IBO blogs that still talk about the Dream Night fuinction. Perhaps not all groups have this function, but I'm certain that IBO leaders talk about making six figure incomes with part time efforts. Even the Dateline expose showed an IBO leader talking about making 250K part time. Why do people believe it? Because they want to. Who wouldn't want a six figure income simply by changing my shopping habits and getting others to do the same? That's how it's pitched in many groups. It become contentious with Amway defenders because the schtick is always "my success is irrelevent to what you could make". Heard Icerat say this on more than one occasion, which provides justification for his lack of results. If it were so good, why isn't he putting in any effort, yet spending all his time defending Amway on the internet pro bono? For the record I've seen the same stuff. It's the selling of "the dream". This is part and parcel of the tools scam. Possibly the group icerat belongs too doesn't play this up as much although I bet if you listened to a good selection of their "tapes" that you would find similar hyping of income. Soap and Hope is the story of Amway. Amway, short for "The American Way", is a national phenomenon. It got it's start as a shop-at-home company dealing mostly in soap and soap products and has now become a one and a half billion dollar a year enterprise. But there is more to Amway than soap. What they're really selling is HOPE. The hope of getting rich beyond your WILDEST dreams. Others insist, however, that Amway is just a clever marketing scheme to enrich a few lucky people. Whatever it is, it has gotten a million people into selling soap and it begins with some old-fashioned motivation. Some of you, right here this weekend, you're gonna leave this weekend and for the first time in your life, you're gonna stay and realize [screaming] "I've got WIIIIINGS!!!!! I can FLYYYYYYY! I am a WINNER! I'm gonna DO it because I have FREEDOM in AMERICA!! This is the world of Amway. A world where a business meeting is not just a business meeting but a celeBRAtion. What are all these people so worked up about? What's going on here that causes 10,0000 distributors to behave like teenagers at a rock concert? The people on this stage are Amway distributors who made it to the top. The one's who've gotten rich climbing the Amway ladder of success. But their main purpose here is to tell these thousands of hopeful Amway distributors in the audience that THEY can earn six figure incomes too. How does it work? Amway manufactures hundred of products. Mainly items like soap and floor cleaners. Vitamins. Cosmetics. Amway distributors buy these products from the Amway Corporation and then sell them mostly out of their homes at a profit. But selling the soap is not how the real money is made in Amway. The real money that an Amway distributor can make comes from recruiting other distributors to sell Amway products too. In return that first distributor gets from Amway a percentage of business generated by his or her recruits. And when his recruits sponsor recruits of their own, he gets a percentage of their business too. And if he can motivate enough of his recruits to go out and recruit more recruits, each sharing a percentage of their business with him, THAT'S how he gets rich. How rich? Amway talks of luxury cars. Of lavish homes. The Amway elite can use the company's jets planes. Go on trips aboard one of Amway's super yachts. trips to Amway's own carribean island. All of this for those who succeed in Amway. WALLACE: Beyond that, people who want to make it in Amway are told to buy the books and tapes and other motivating tools [shots of distributors buying books and tapes] that will teach them how to do it. The marketing these items runs into the millions of dollars a year. And that cash goes not to the Amway Corporation but to the high level distributors who run these rallies - paid for by the hopeful Amway novices who come to those rallies by the thousands. And then when you get back home and you knock on the door, it's slammed in your face each time you say Amway because people are SICK of hearing it. Last edited by Joecool; 18th August 2011 at 12:19 PM. That's right, a scheme that if not for some well-worded rules and policies, would have been found illegal by the FTC. But all the legal mumbo jumbo in the world can't hide the fact that Amway is a thinly-veiled pyramid scheme. The products are merely incidental to recruiting more people to "sell" under you. The only thing that kept the FTC from ruling it illegal was the fact that Amway had a 10 customer rule and a 70% rule. But, as the statistics and testimonials show, those rules are not really enforced. And now you don't even need 10 customers, just 50PV. And the 70% rule allows you to count your own purchases as sales volume! It's obvious that the rules exist only for appearances and the reality is very different. How do you know I haven't been pursuing something better? I should hope so! If you are working a minimum wage job, you are pursuing something better. How do you know I haven't been in jail for the past decade? How do you know I haven't been working for charity? I don't. Have you? And if you have, how does that give your perspective on Amway any more credibility? You have no idea of my motivations or life circumstances. And you have no idea what motivates the average entry-level IBO. Just another bankrupt argument typical of the mlm critics. They dismiss supporters of the model who are involved as biased. The dismiss supporters of the model who are not involved as lacking credibility because they're not doing it. It's a perfectly valid question. You are supporting the model as a valid business opportunity despite the fact that you yourself have not made any money with Amway and, in fact, use Amway just to buy a product here or there. So, how can you testify as to the legitimacy of the Amway model? If you could say, "Look at me! I started with $10 in my pocket and now I'm raking in $200K! And I did it in 3 years by working really hard to develop my network," that would be one thing. But all you are doing is spouting the Amway line about "2-5 years," and similar marketing fluff. And why do you dismiss the testimonials of people who have had really bad experiences with Amway? Oh, yeah, they didn't work hard enough . . . I'm also noticing, as I read through the many posts in the blogosphere, that many of your arguments are lifted almost verbatim from Amway supporter blogs. If you're sitting on the sofa and your brother walks in and you say "wanna buy an XS?" and he says "no" - you're considered active. $115/mth is pretty good for that kind of effort, don't you think? If you ask your brother, once, in a whole year, if he wants to buy a can of XS … and he says no! … you’re active! $115/mth is a pretty good income for that, isn’t it? That's almost identical with just some words changed around. It seems to me that you are likely the author of many of these pro-Amway blogs or, worse, just paraphrasing and parroting back what they've said. If you are just going to regurgitate other people's ideas, you should at least quote them and attribute the source. If you are indeed the author of some of these blogs, then come clean. The accusation has been made that most of those bloggers are paid Amway shills who don't have much experience with Amway themselves. . .
As for me, I'm just a regular dude who has seen some bad stuff related to Amway. I've looked at the opportunity several times as my family and friends pitch it to me. As a result of some Amway-related shenanigans that my Aunt got involved with, I got a pretty in-depth look of how the model actually works. None of them have ever made a dime in profit by "selling" Amway (buying for themselves and recruiting others to do the same), but they sure have spent a lot on BSM and product. Like I said, I've lost friends and family relationships because I tell them exactly how I see it. I'm not an "Amway critic" except here on this thread and to anyone who pitches it to me. This is the first time I've actually made any "public" comments about it at all. So come clean: Are you a shill? If not, why are you so passionate about the Amway "business opportunity" if you've never actually pursued it as a business? I think there is a strong case for saying Amway is two businesses. There is the one that sources/manufactures the products and that is highly profitable as it sells them to the second half of the business. That is the pyramid like conglomeration of "independent" business which buy/distribute these products. The reality for the parent business is that for as long as new recruits keep getting signed (by whatever method) and keep buying (or hoarding or using) the products it will make a profit. It has decided that rather than selling it's products to the mainstream wholesale and retail markets (where there is lots of competition) it is better off creating a "lifestyle opportunity" and as there's a mug born every minute it's doing quite well. However the vast majority of "mugs" aren't but that's their problem because they're not buying enough motivational tools and anyway they were mugs in the first place! The products are merely incidental to recruiting more people to "sell" under you. The only thing that kept the FTC from ruling it illegal was the fact that Amway had a 10 customer rule and a 70% rule. Partly yes, because (as the FTC said) they deter inventory loading, which is illegal. The FTC's conclusion was that "The Amway system is based on retail sales to consumers"
That remains the case today, something you haven't disputed, you've simply tried to claim one class of consumer isn't a consumer, contrary to the FTC's clear advice. But, as the statistics and testimonials show, those rules are not really enforced. Yet statistics and testimonials also show they *are* enforced. I don't get bonuses in the US. Believe me, I wish I did. To get them I need to have registered customers with full contact details, and Amway randomly contacts customers as checks. And now you don't even need 10 customers, just 50PV. And the 70% rule allows you to count your own purchases as sales volume! It's obvious that the rules exist only for appearances and the reality is very different. As the FTC said, the 70% rule is about preventing inventory loading. If you use the stuff yourself then that influences inventory loading just as much as onselling. Yes I do. I've been an entry-level IBO. I've sponsored personally, globally, maybe 40 people. I've shown the business and done followups to many more - and I explictly ask them their motivations. "Diamond" income is virtually never the answer. In addition we have the Amway Japan surveys, DSA surveys, and testimonials to the FTC. You have provided no evidence at all to support your opinions. That is false, I made money with Amway. and, in fact, use Amway just to buy a product here or there. So, how can you testify as to the legitimacy of the Amway model? ROFLMAO! Didn't I just predict that very objection. But all you are doing is spouting the Amway line about "2-5 years," and similar marketing fluff. I've never mentioned "2-5 years" once. You're just making stuff up. Again. I've never done that either. Making up more stuff. TTAA is my blog, yes. Joecool has already pointed that out. No idea what other blogs you're talking about. The accusation has been made that most of those bloggers are paid Amway shills who don't have much experience with Amway themselves. . .
Joecool and others continue to make that claim about me, despite it having been explictly denied both by myself and Amway. Interestingly, nobody questions the motives of Joecool, who actively runs at least 4 blogs and has written several hundred blog posts this year alone. As for me, I'm just a regular dude who has seen some bad stuff related to Amway. I've looked at the opportunity several times as my family and friends pitch it to me. As a result of some Amway-related shenanigans that my Aunt got involved with, I got a pretty in-depth look of how the model actually works. That knowledge of the model has not been in evidence here. None of them have ever made a dime in profit by "selling" Amway (buying for themselves and recruiting others to do the same), but they sure have spent a lot on BSM and product. Yet most people spend nothing on BSM, and many people, like myself, have made money. Like I said, I've lost friends and family relationships because I tell them exactly how I see it. Interesting. You admit you've lost friends and family relationships not because of Amway, but because of your behaviour. So come clean: Are you a shill? If not, why are you so passionate about the Amway "business opportunity" if you've never actually pursued it as a business? I have pursued it as a business. I pursued it actively for less than 2 years and made decent money, pretty much exactly what I was told I would for the work I put in. Indeed, that business continues to generate income a decade later with no work being put in to it - something which was actively predicted against. When I was active I encountered various claims on the internet that were completely contrary to my experience. That doesn't mean others experiences are false, but it does mean they're not universal. I began researching and discovered while various negative experiences reported on the net were based in real experiences, many of the comments were outright false or at best over-generalized, often by people (like Russell Glasser) who actually had no real knowledge of the model, so I started a pro-Amway blog addressing the myths, misconceptions, and overgeneralizations. For reasons that had nothing to do with Amway I had to stop building my Amway business and when I later divorced I transferred it to my former wife. My pro-Amway blog eventually came down too. A few years later I was living in Paris for a few months and got sucked in to debating Amway on sites like QuixtarBlog, where I discovered the same myths, misconceptions, and over-generalizations persisted. It became a hobby to research the company and I've collected as much information as I can, from court cases to annual reports, to media articles to website reports etc etc etc. My last and only full-time job before I went into the business world was as a university researcher so I have experience in doing this properly. Eventually I realised on websites I was repeating myself so I started TTAA so I could just point to a post rather than say it all over again. I also started AmwayWiki as an information repository. I haven't done much with it but others have. In this discussion you've gone through the whole standard gamut of criticisms against Amway. Some of them (like "legal illegal pyramid") just make no sense, others like your understanding of FTC vs Amway and what makes a pyramid are just wrong. Others, like experiencing people not retailing and Amway not enforcing it, or over-hyped exaggerated income claims, are simple over-generalizations. One thing I discovered in my research, for example, is that virtually every distributor related lawsuit regarding Amway, and pretty much all internet criticism, had its origins/experiences in just one Amway "system" and it's offshoots. All the rest of Amway, which was by far the majority, generated very little complaints or criticism. As with other areas, people over emphasize the importance of personal experience and fall hard for confirmation bias. It's hard for people to fathom how big Amway is. Even if you attend a seminar in the US with 40,000 Amway IBOs - you're experiencing just a minority of active IBOs even just in the US. "Amway distributor" is not a homogenous description. It covers everything from the person who just joined who is buying stuff cause they want it to cheap, to the multi-millionaire who has been building a global business empire for decades. It covers the backpacker selling water filters door-to-door to restaurants to the professional trainer marketing Nutrilite to his clients. It covers guys running professional, ethical, businesses to folk actively, and even knowingly, trying to scam people. It really is way way way bigger than you know. Last edited by icerat; 18th August 2011 at 02:44 PM. Others, like experiencing people not retailing and Amway not enforcing it, or over-hyped exaggerated income claims, are simple over-generalizations. One thing I discovered in my research, for example, is that virtually every distributor related lawsuit regarding Amway, and pretty much all internet criticism, had its origins/experiences in just one Amway "system" and it's offshoots. Icerat likes to minimize the problems within the Amway systems. I was in WWDB and attended more than one function that had 15,000 to 20,000 IBOs in attendance. My sponsor told me that the previous year, he attended a function in an NFL stadium with over 50,000 in attendance. Some of the things taught: Buy from yourself, no selling was emphasized. Never miss functions. The group was taught how long they could skip mortgage payments and avoid home foreclosure, how long you could delay paying bills without the lights being shut off. I assume it's because these "mentors" wanted every cent they could shake out of the IBOs. We were taught o answer a question with a question. We were told that your baby will be sleeping at night so they won't miss you being out of the home. I'm certain that most groups are more similar than not. I don't know that much detail about Icerat's group, but I still see things online about his group that indicate it's more similar than not to all other groups. The common thread seems to be never give up and buy tools. I don't see why Icerat makes a fuss over me having my three blogs (Amway, WWDB and Amway in general) Icerat himself owns about 20 blogs, a forum and basically runs Amway wiki. Additionally, he's got 5000 posts on quixtar blog, over 2000 posts here and who knows how many other comments under Icerat, IBOFightback, Insider, Insider 201283, Anonymous and other nicknames. He even has google alerts so he knows when someone posts something about Amway on the internet. He calls me obsessed? I've been to one of their talks, it reminded me of the seminars from "Yes Man" where Jim Carrey is an outsider missing out on life from not utilizing the word "yes" . Nearly everyone in the audience laughed at the speaker's corny jokes and applauded at every "inspirational" thing he said, even though his talk was a very convoluted way of talking about network marketing. Last edited by therival58; 18th August 2011 at 04:20 PM. 1.- Thou shall have no other MLM before Me. 2.- You shall not make for yourself a carved image of Rich DeVoss. 3.- Thou shall not take the name of Amway in vain. 4.- Remember thy business model, to keep it holy. 6.- Thou shall not murder the newbies' illusions. 7.- Thou shall not commit to other MLM's. 8.- Thou shall not steal down lines. 9.- Thou shall not bear false witness for Nutrilite. 10.- Thou shall not covet thy neighbor's level. LOL, beware, someone will be here soon to refute all of your claims! P.S. Amway and their attached tool companies operate as a scam amd it's a good thing there are forums and blogs to provide information to unsuspecting information seekers. It's not a legalized illegal scheme. As noted, it's just a bad business model, just like running up debt on a credit card or using the services of a payday loan office. Not illegal but a bad idea. Note: Groups using the "buy from yourself Matnra might be running illegal pyramids. It seems many groups are in violation of the condition of that 1979 FTC ruling. How do you know I haven't been pursuing something better? How do you know I haven't been in jail for the past decade? If you were in jail, it would explain why you had so much time to defend Amway. This is the part that cracks me up. Mr. Super Amway has never even run a large amway business. Certainly he hasn't hit any of the pins with real money attached. So why would we listen to what he has to say about the success of those people that have? To be fair, I don't have personal experience with Amway either. I've seen first-hand how bad it can be, but that doesn't necessarily mean that what I've seen is the norm. But when you look at the actual evidence as provided by Amway itself, I don't see how any rational person can conclude that Amway is a good business opportunity. If someone offered me an opportunity to franchise BurgerMasters, but I read in their promotional literature that only .5% of all people who open BM franchises make any significant money and that most people make nothing, then I would not open a BM franchise! Somehow, I don't think I would be mollified with, "But most people only open a BM franchise to get a discount on burgers," or, "Only those that work really hard will be successful." Add to this the documented abuses in the AMOs and my impression of Amway seems to be justified. I see no evidence presented that counters this view. Icerat has claimed in the past, that once upon a time, he had built his Amway business to a point where he made "a couple thosand" a month. Oddly enough, he apparently gave away his precious Amway business to his ex wife in a divorce settlement. Being that such a successful business would secure your financial future, why would he give up the business instead of everything else? Since then, he claims that he has not made it a priority to rebuild his business to that level. Since about 2004, he's been saying "that's about to change". I find it strange that his efforts have been focused on defending Amway rather than building it. Short summary is that some of the larger AMO's used my software for tracking sales so I got to see the data. So I do have the experience seeing the internals that icerat lacks. Strangely enough, we don't even need specifics to know that the big money is made on the seminars, etc. There is a much higher profit margin on tools and less people to share those profuts with. We can reasonably conclude that the diamonds etal make their real money from tools. Icerat's defense is that diamonds don't make a lot from tools. Even though the diamond might own a corporation who rakes in the dough. He works on twisting semantics but this crowd on this forum sees right through it. Because based on your assertions, nothing is better than Amway? ADA – Authorities in the Indian state of Kerala have shut down Amway's operations there amid allegations the company was operating as an illegal “money chain” and “cheating,” according to Indian media accounts. Amway spokeswoman Andrea Clark confirmed the shutdown and said the company is working with authorities to resolve the issue. One of the world's largest direct selling companies, Amway has long faced regulatory scrutiny and has spent decades fighting charges that it operates an illegal pyramid scheme. In recent years it has spent millions of dollars to rebuild its image through advertising, high-profile endorsements and marketing of its Nutrilite supplements and Artistry cosmetics lines. In 2010 the company settled a long-running suit in California that alleged it was a pyramid scheme by agreeing to pay $56 million without admitting guilt. In 2008 a judge in the United Kingdom threw out a case against Amway in which the company had been charged with misrepresenting its business and putting the sales of training "tools" ahead of selling products. The dismissal of the case came only after the judge decided Amway had reformed its business practices in the country. Amway distributors in Asia and most other markets are only supposed to make money when they sell Amway products, though they can receive additional bonuses when their sales groups meet certain product sales goals. U.S. distributors are able to make money from sales by their “downline” distributors – typically those who they helped recruit into the business -- with minimal selling on their own. Various press accounts said local police had been “harassing” Amway distributors into providing false or misleading information about the business. Clark said the company's business model may not be for everyone, but the Amway offers all of its distributors a full money-back guarantee. “You have to sell products to make money,” she said. Clark said actions by authorities in Kerala do not affect operations in the rest of India, which has become one of Amway's top 10 markets in terms of sales. The company has said it is considering building a new factory in India to serve the local market. The company set a goal of hitting the $500 million sales mark in the country in 2012, up from around $300 million in 2010. During the raids a photographer for a local newspaper covering the raids was detained by Amway at one of the distribution centers and his equipment seized until photographers from other media organizations covering the raid protested, according to IBN Live, an Indian news website. A complaint against the company has been filed by a press organization there, according to The Hindu Business Line. Last edited by Joecool; 30th August 2011 at 05:27 PM. So basically, I've left this thread for a bit and come right back to where I left off? Note as per my sig I don't even see JoeCool's and NewtonTrino's posts, I got sick of dealing with their "outright misrepresentations" (and in JoeCool's case, outright falsehoods). I doubt they've changed their mantras. BTW, a new partnership between Amway and the Detroit Red Wings announced today, including Nutrilite as official supplement. And Amway has also said they've got double digit growth in North America this year. The only misrepresentation has been on your side. However, since you have no authority to speak for amway, nor have you created a successful amway business why would anyone listen to you anyway? He doesn't read my posts, yet he suggests I am posting falsehoods? Wow, Amwya partners with the Red Wings. And that somehow makes the Amway opportunity better how? Double digit growth? Nice. What does that mean? Are IBOs making money or still getting scammed? Double-digit growth? Not surprising. Get-rich-quick-scams flourish in troubled economic times. Interesting thesis. What does the 1997/1998 financial crisis and Amway sales say then? 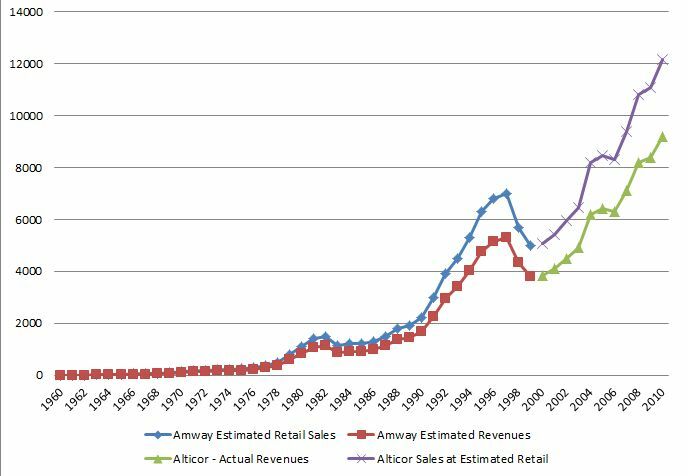 *Note: In 1999 Amway changed from reporting estimated retail sales to reporting "wholesale" sales to distributors, under the Alticor banner. Last edited by icerat; 1st September 2011 at 02:17 PM. This is how Icerat diverts the conversation. Amway had good sales, Amway did well in 1998. Amway partners with the Red Wings. The Amway IBOs are still getting scammed by motivational groups such as NETWORK 21 or WWDB and IBOs, the vast majority of them are LOSING MONEY. IBO success has ZERO to do with how well Amway the corporation is doing. In fact, Amway's growth could indicate that even more IBOs are now losing money. By the way, I was once upon a time, stupid enough to join Amway. I did build a sizable business. I was one level below what is known as "platinum", or I was at 4000 PV. At that level, I was told that my net profit would be over $1000 if I built it right. I built it right, as per my upline's advice and my net profit was ZERO. I was then told that the money would be there if I just kept going. I did the math and concluded that going platinum would likely have netted me ZERO as well, because the expectation was to reinvest your profits into more and more tools. Although a dated study, a Wisconsin Attorney General did a study on platinums in Wisconsin and platinums on average lost $900 a year, which confirms my experience. I think it would be really interesting to see how you sold 4000 in PV as well as what your expenses were. I had 12 people personally sponsored (frontline). All told, I had about 34 IBOs or so in my group, including myself. My expenses were possibly higher than others because I had to attend functions on the mainland (I'm from Hawaii). (You can't listen to the same one every day right? However, 4 times a year we had to travel for major functions. The last one I attended was Family Reunion, which costed $240. However, travel in July (peak) was about $750 for a round trip ticket, airport parking, hotel, rental cars and the function ends up costing about $1300. with 4 major functions, your average monthly expense (averaged out) is another $400 a month on average. Thus my average monthly expenses was about $780. Factor in other expenses such as sample packs, cost of catalogs, meals, business attire, etc and the monthly expense at that level exceeds $900 a month. At 4000 PV my bonus was about $1000. I was making pennies per hour for my efforts. Prior to 4000 PV I was losing money. P.S. I'm suire there were some other misc expenses that I have left out. How I sold 4000 PV? Most IBOs did over 100 PV. I sold some stuff to family and friends, but other than that I had no sales other than to myself. I'm pretty sure the rest of my group was about the same. Contrary to Icerat's claim that "most" IBOs do nothing, everyone in my group at least ordered some stuff, although some ordered a little bit of stuff and did not qualify for a bonus. I also had a few who ordered stuff at first and then did nothing. (This is based on what I remember from my IBO days). Last edited by Joecool; 2nd September 2011 at 03:16 PM. By the way, I was watching a show on Discovery the other day about lottery winners. They all seemingly have mansions and nice cars, therefore, the lottery must be a good way to earn money if we justify it with the same reasoning used by Amway diamonds. But his schtick is the same. That blogger took him down pretty hard in the comments too! I don't think the Red Wings sponsorship is all that big a deal. Amway is a legal business and they have plenty of money to advertise with as is their right. If the Red Wings want to be associated with Amway, that is their right as well, but they have to be ready for whatever negative publicity comes their way. There is a significant portion of their fan base who is ticked off about this, obviously, but in the end it won't really hurt them. Fans aren't stupid, they know their teams have to get advertising dollars in -this is just another advertiser which most of them will ignore. I am greatly encouraged by the overwhelmingly negative comments on various fan boards: Icerat's is the only positive one I can find. Why does this remind me of idiocracy? That double digit growth might be attributed to the large price increases on products and shipping! What a business! Again, it's great for Amway but says nothing for the collective IBOs. Last edited by Joecool; 16th September 2011 at 05:23 PM. Breach of rule 4 removed. Last edited by Cuddles; 27th September 2011 at 05:46 AM. I think it's funny that he refers to people retiring as Emeralds or whatever. Someone please find me these emeralds who are retired roaming the beaches of the world. It's a myth like bigfoot or UFOs. Lots of people talk about them, but no bonafide evidence that they exist. These Amway folks don't retire. They work until they die or fade into obscurity. Even mega triple ripple diamonds are working, possibly because they have to. You can probably live a nice middle class lifestyle at the diamond level. I believe the jets and mansions paid for in cash are a myth also. Last edited by Joecool; 27th September 2011 at 04:23 PM. I believe the jets and mansions paid for in cash are a myth also. I don't think they are a myth but they are reserved for those that make the most from amway. Those who started the business (e.g. those who own the corp) and those who have large side businesses selling "tools" into the organizations (Yeager, Dornan etc).